How does gold do in a recession? It’s a fair question, because recessions are usually no fun for investors. And gold is usually thought of as an inflation hedge, the opposite scenario of what usually occurs during a period of negative economic growth. Probably the best way to answer this question is to look at history to see how gold has performed during economic slowdowns. The most common definition of a recession is two consecutive quarters of negative gross domestic production (GDP). Since 1970, there have been seven official recessions. This chart shows how the gold price performed in each of those periods of negative economic growth. 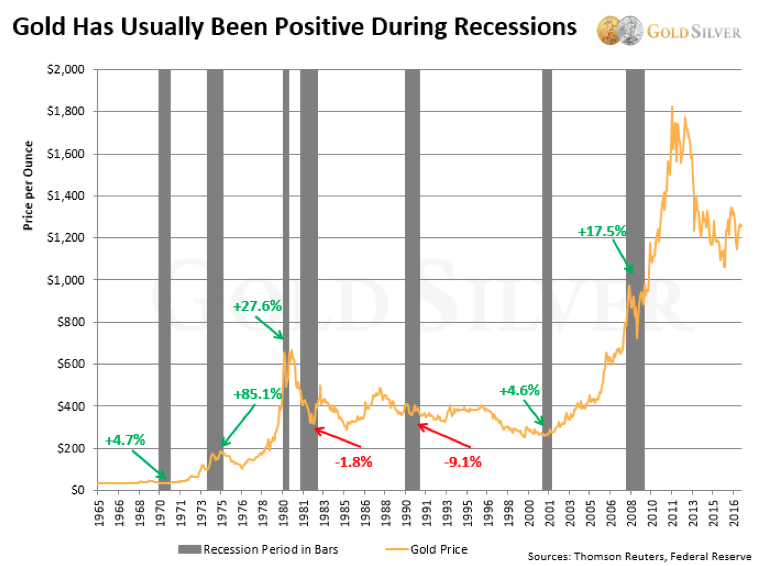 The gold price is represented by the gold line, and the recessions are highlighted in gray bars. In five of the seven modern-day recessions, the price of gold at the end of the recession was higher than at the beginning. Only one of the declines was significant: a loss of 9.1% in 1990. Gold was basically flat in the 1982 recession, but otherwise you can see it rose in all the other recessionary periods. Even in the midst of the financial crisis of 2008-09, the gold price ultimately moved higher. Yes, it initially fell in October 2008 when the crisis first struck—due more to liquidity needs than anything else—but the price quickly rebounded and was 17.5% higher by the time the recession ended. Although specific economic conditions vary during recessions, historically gold has done well more often than not. Why Does Gold Usually Rise In a Recession? Gold performing well during a recession makes sense when you think about it. A slowing economy usually increases fear among investors, and gold is a natural refuge when worry strikes. And keep this fact in mind: the odds of another recession are 100%. That’s not some wild prediction; there have been 13 official recessions in the US since the Great Depression, and as many as 47 since 1790. The US was on a gold standard and so the price was fixed during many of those, but even during the Great Depression the only form of gold citizens could own rose dramatically at that time. So, no matter your personal level of optimism or how much money you’ve made in the markets, you must accept that another recession is inescapable. And since recessions typically impact investment returns in negative ways, it may be prudent to include some gold in your portfolio as a buffer. In the big picture, though, gold is less about inflation and deflation, and more about crisis and fear. If your country is in a crisis, or fear among investors rises, regardless of the origin of those fears, gold is likely to rise, too, whether you’re in a recession or not. That’s a pretty powerful tool to have in a portfolio. History says that the gold investor doesn’t need to fear the next recession. Gold is more likely to rise than fall. But owning gold is about more than it potentially doing well in the next recession. It’s about gold’s ability to hedge your portfolio against crisis, including a correction or crash in the stock market. Remember, gold has characteristics that most other investments don’t offer. So regardless of the exact circumstances of the next recession, or when it arrives, it may be worth insuring your portfolio against those negative impacts.